Left ventricular non-compaction (LVNC) is a congenital cardiomyopathy characterized by deep ventricular trabeculations thought to be due to an arrest of myocardial morphogenesis. Integration of various cardiac imaging modalities such as echocardiography, cardiac computed tomography and cardiac magnetic resonance imaging help in the diagnosis of this rare clinical entity. We describe a child with rare variant of LVNC with predominant involvement of interventricular septum resulting in multiple ventricular septal defects. A 14-year-old boy was referred for evaluation of asymptomatic cardiac murmur. Clinically, he had Grade IV pansystolic murmur along left lower sternal border suggestive of ventricular septal defect. There was no evidence of pulmonary hypertension. Electrocardiography showed prominent R waves in right sided chest leads. Chest radiograph showed normal cardiac size with normal pulmonary flow. Echocardiography showed irregular borders of interventricular septum and extensive muscle bundles inside both left ventricle with obliteration apex [Figure 1]a and [Video 1]a. On color Doppler examination, multiple tiny ventricular septal defects were noted with left to right shunt [Figure 1]b and [Video 1]b.
Cardiac catheterization was performed to assess the shunt and number of ventricular septal defects. There was insignificant step-up at right ventricular level and pulmonary artery pressure was normal. The calculated QP/QS was <1.5:1 suggesting restrictive ventricular septal defects. Left ventricular angiography in left anterior oblique (LAO) cranial projection showed irregular interventricular septum with multiple recesses and filling defects [Figure 2]a and [Video 2]a. It also showed multiple tiny ventricular septal defects with left to right shunt. Left ventricular angiography repeated in right anterior oblique projection showed multiple crypts and recesses along diaphragmatic surface of the left ventricle [Figure 2]b and [Video 2]b. Right ventricular angiography in LAO cranial projection showed normal size right ventricle with normal function. Even after ventriculography, the anatomical details were unclear. He underwent cardiac computed tomography (CT), which showed irregular meshwork of muscle bundles obliterating the left ventricular apex [Figure 3]a and [Figure 3]b. There were multiple prominent trabeculations, crypts, with deep serpiginous recesses predominantly involving the interventricular septum [Figure 3]c and [Figure 3]d resulting multiple ventricular septal defects. The cardiac CT features were consistent with non-compaction of the left ventricle with predominant affliction of the interventricular septum with multiple tiny muscular ventricular septal defects. 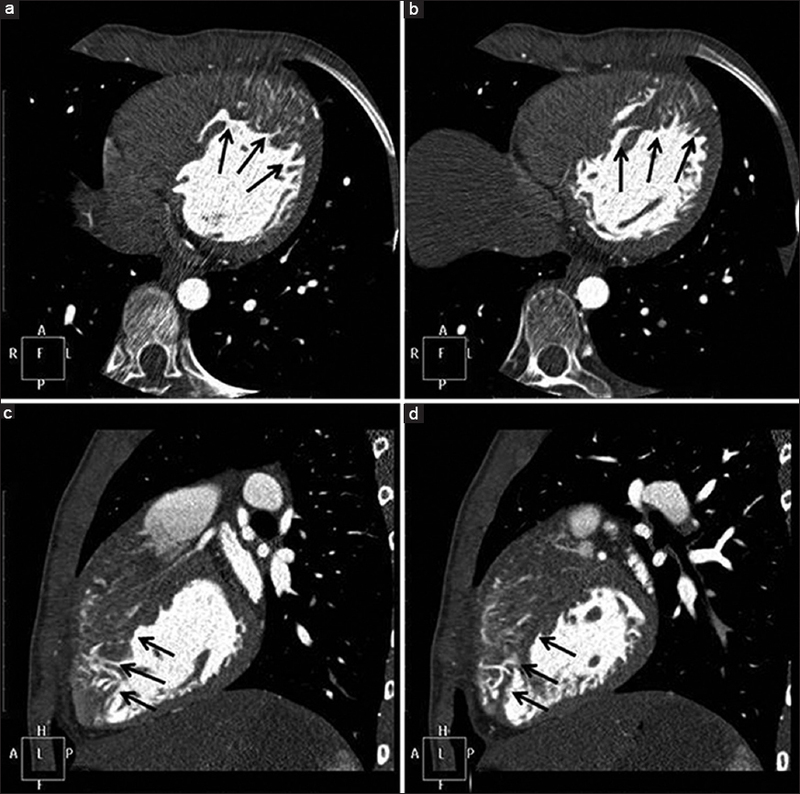 In our patient, cardiac CT enabled the non-invasive diagnosis of LVNC; thus, highlighting the potential utility of this imaging test for elucidating this rare entity and invasive ventriculography demonstrated associated with multiple tiny ventricular septal defects, which is undescribed in English literature. Further, this case illustrates the integrative nature of various cardiac imaging modalities in diagnosis of this rare clinical entity. Chin TK, Perloff JK, Williams RG, Jue K, Mohrmann R. Isolated noncompaction of left ventricular myocardium. A study of eight cases. Circulation 1990;82:507-13. Ritter M, Oechslin E, Sütsch G, Attenhofer C, Schneider J, Jenni R. Isolated noncompaction of the myocardium in adults. Mayo Clin Proc 1997;72:26-31. Conces DJ Jr, Ryan T, Tarver RD. Noncompaction of ventricular myocardium: CT appearance. AJR Am J Roentgenol 1991;156:717-8. Junga G, Kneifel S, Von Smekal A, Steinert H, Bauersfeld U. Myocardial ischaemia in children with isolated ventricular non-compaction. Eur Heart J 1999;20:910-6.